Opera’s behind-the-scenes world can be a mysterious place. And many who do the heavy lifting behind those glamorous walls—whether moving scenery or working the phones to find a last-minute replacement for an ailing soprano—prefer to keep a low profile. Among them is Jonathan Friend, artistic administrator at the Metropolitan Opera and, as such, one of the key players in the business. Born in London, Friend arrived at the Metropolitan in 1981 after posts with the English National Opera and English National Opera North. 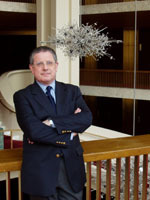 The Met’s artistic administrator since 1984, he is the man who has scouted and hired thousands of singers and conductors to fill out the company’s performance roster over the years. Among other talent-seeking missions, Friend served on the jury of Plácido Domingo’s Operalia competition in Verona, Italy, last summer. But he also can be found talking up the Met’s current season to 21-to-45-year-olds at wine and cheese events for its Young Associates Program. He reassures nervous young singers at the finals of the Met’s annual regional auditions. The Met schedule is punishing: 26 productions a year, seven performances a week for a total season of more than 200 performances—that’s a lot of singers to hire. But Friend is able to laugh at the often insanely chaotic opera world. “He has a great sense of humor, which you just have to have,” said one colleague who has handled more than his share of chasing after artists to fill last-minute cancellations. Friend faced a perfect storm of cancellations in spring 2006 when he had to find five replacement conductors for Levine, who had been sidelined with a torn rotator cuff. Philippe Auguin agreed to take over the Met’s Lohengrin, even though he was scheduled to conduct Walküre in Italy, where an orchestral strike was looming. He found another replacement, for Parsifal, in Peter Schneider, who had planned to take off the holidays with his family. When Friend convinced the conductor’s wife that New York was the ideal place for holiday shopping, Schneider became available.